Nota : i dont Know to mush english . and i dont know were to send that ..
Like the new Menu and the words piant .. And lines is very Light and dark i cant see it . And Themes are Small in Opera developer 45 New UI Look.. in The Old Look (Opera 43 ) Themes Look Better and Bigger .. The Browser Must be More Clear for the Themes not very Big and not Very Small ..
Just There are too many Empty and Died Area .. if they Gone .. that will be Better for the New UI Look and the Themes . 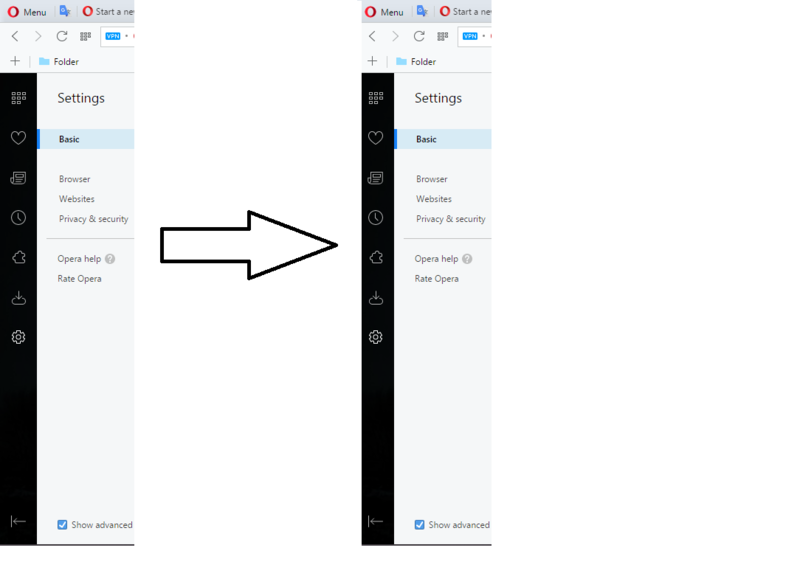 the VPN Button is very Small and it can be Bigger .. not all who use opera can see that small Button and if its Bigger will be Better For the Looking ..
You do realize it is Opera 45 Developer now, yes? or opera dev 45 have different UI ?!!! 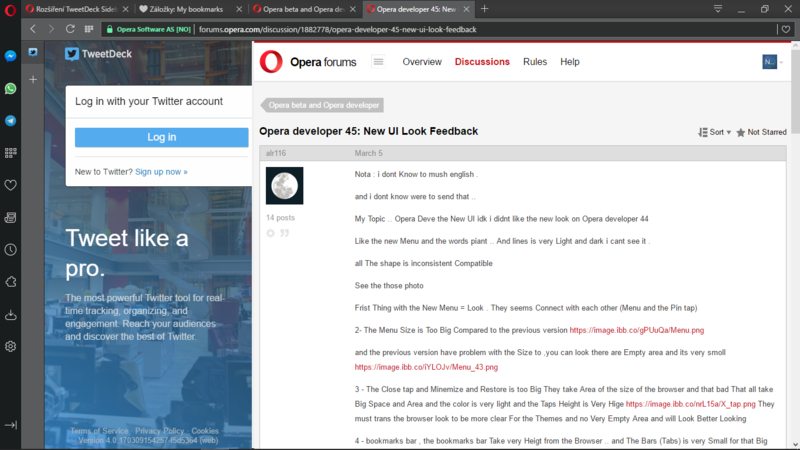 Opera 44 Beta does not have the new UI, that was the point I was making. If you're going to continue using this thread, I should change the title to avoid confusion. ok no problem thank . Like i say .. the shape of the Browser is very Big and there are too many empty and dead area and there are no need for them ..
Also, it would be nice, if those buttons were movable and the Bookmarks tab wouldn't open as a separate site but like the Messenger apps, as a popup and would be pinnable. You would be able to access all the bookmarks without leaving the site and immidiatelyl access them. The new Sidebar is nice. BUT There's already one sidebar! In fact, one is the sidebar and the other is the extensions sidebar. There have been some requests regarding this. and the Bookmarks tab wouldn't open as a separate site but like the Messenger apps, as a popup and would be pinnable. It need not to show extra text on the right of https secure sign in the address bar. Or it can be toggled by settings. I don't think it's related to the new UI. Or I'm missing something? Also when entering text in adress string, suggested text are forced gray too. Forced blue and white backgrounds looking awful too. Please fix it, so text and background colors must be system based, not forced. You may move it properly. Unfortunately replies can't be moved like in My Opera. oh will if they just Reshape The Browser To remove All Empty and Dead Aera Because There are to many and there is no need for Theme ..
Nota : i know Nothing will change from my words ..
New Feedback about the VPN Button .. The google Search Box in Speed Dial .. it is too big .. 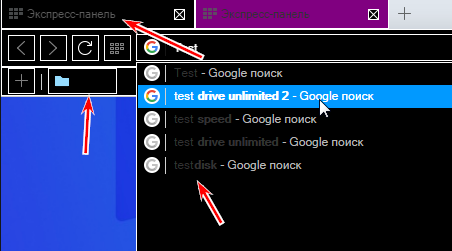 Bigger then the Search Box in opera 44 stable ..
and that not Cool for the Speed Dial Bars..
my suggest is just .. to reshape the google search box to Become smaller ..